What’s a Blaecorn Unidragon? According to Clown Shoes, it is the ultimate mythical creature, a combination of a dragon and unicorn. The beer named after this created creature is a Russian Imperial Stout, and it’s a big one: 12.5% ABV (alcohol by volume) and brewed with a monster amount of malts. Clown Shoes are pretty new to the scene of craft beer, having only been around for a couple of years. Not much information is out there about the history of the company, but it appears to me that their beers are brewed under contract by Mercury Brewing Company in Ipswich, Massachusetts. Mercury produces beer for several different companies, and they even make craft sodas. In June, I reviewed my first Clown Shoes beer — their Vampire Slayer, which is also an Imperial Stout. I was highly impressed, giving it 94 points. For me, Clown Shoes are a perfect example of not judging by label appearance: I held off for a long time buying any of their beers because I’m not a fan of the label artwork. How stupid that was — and I hope this beer lives up to the impressive flavors found in Vampire Slayer. Pouring produced an average size, creamy head that quickly faded. The beer was dark black in color, opaque, but did have some faint lighter brown highlights at the very bottom of the glass. I noticed as I poured that this appeared to be a filtered beer, free of particles and sediment, but the pour was thick; muddy-like. As expected with the high alcohol, lacing was fair at best, leaving a few patchy films on the glass. On the nose, Blaecorn Unidragon commands your attention. Heavily malted, the stage is set with plenty of dark chocolate, coffee, and just a twist of smoke. There are also dark fruits; specifically prune and raisin, and there’s nice subtle whiffs of vanilla and licorice. There’s also a light hop presence, like a dry grapefruit. The combination of the chocolate and smoke paired well, and the best news is that the alcohol was completely hidden. And when I say completely hidden, I mean undetectable, like a ghost. The taste greets the palate with a combination of dark fruit and chocolate, which leads to a middle of the mouth opening up of coffee, licorice, and a gentle presence of smoke; smokey flavors aren’t my thing but this is just perfect. This beer is full-bodied and thick, creamy, with a finish that continues the tasty pairing of smoke, dark chocolate, and almost burnt coffee. 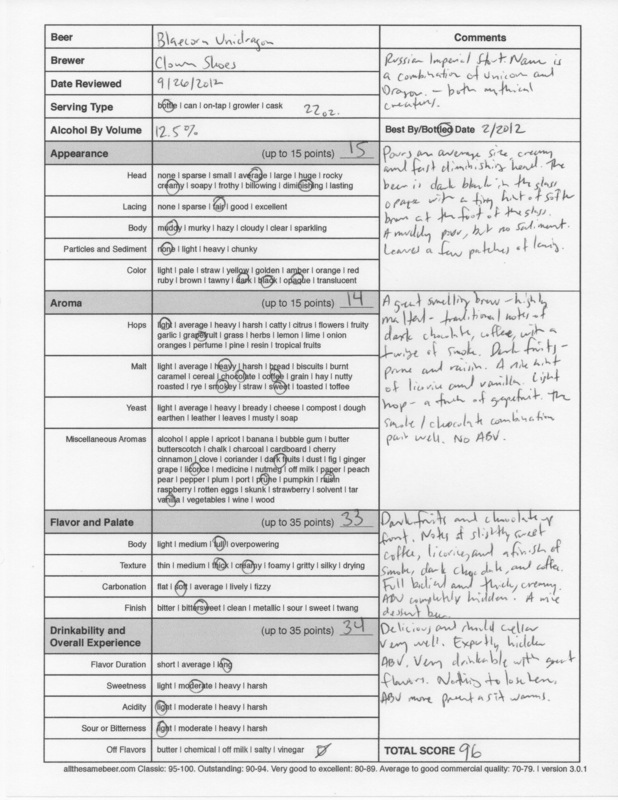 While fairly sweet, there is a little bite from some bitterness, but it’s not overwhelming at all. And the alcohol? Again, hidden — but as it warmed, it started to come out more in the taste. You can feel this one going down and it does warm your entire body. 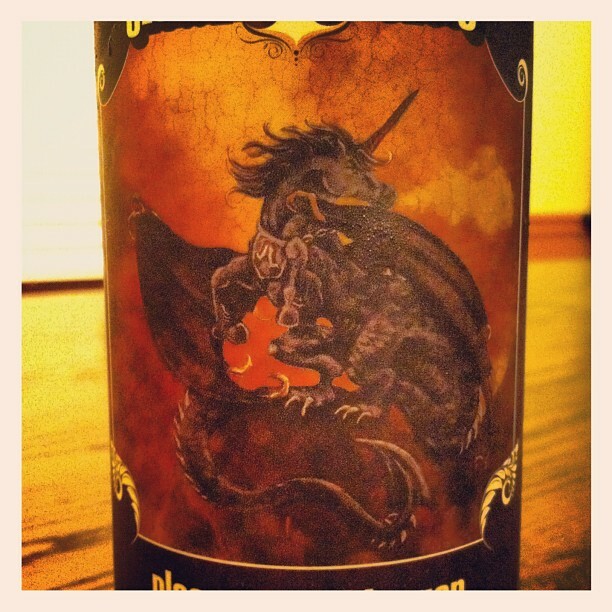 Blaecorn Unidragon is delicious and is screaming to be put in a bourbon barrel. Not only are the flavors mouth-watering, but the alcohol is expertly hidden and drinkability is dangerously high. Be careful here. If you see this in your local bottle shop, don’t hesitate — you’ve got nothing to lose. Except maybe your mind, because this is a mind-blowing brew. 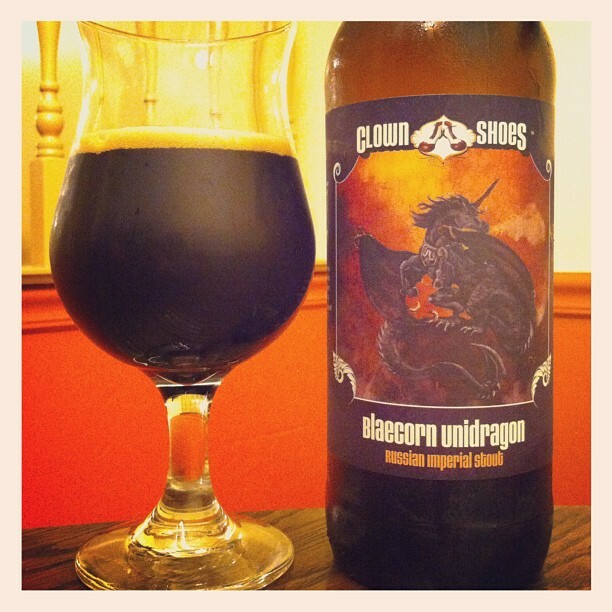 Clown Shoes Blaecorn Unidragon, 96 points. Price: $8.99 US for one 22 oz. bomber size bottle.